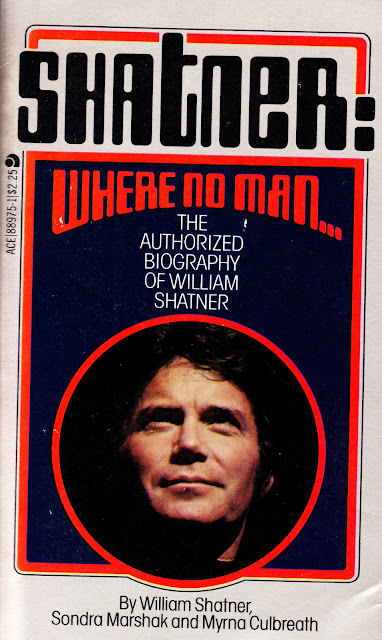 It's Shatner: revealed and intimate (but, unfortunately, authorised)! But, in the 1970s, he was bidding his time in TV movie-land, voicing the TREK animated show and waiting for Paramount to decide what to do with their would-be franchise. 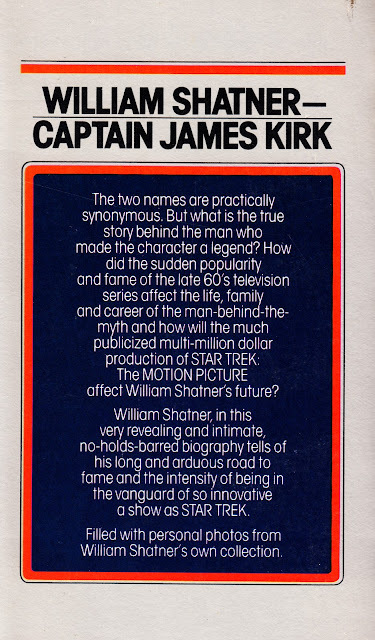 That obviously gave him plenty of time to plan this paperback tome (so significant that it required two co-writers), cunningly timed to coincide with big-screen blockbuster STAR TREK: THE MOTION PICTURE. I've not actually read this yet, I acquired it (along with several other behind-the-scenes-type) TREK paperbacks from a charity book store, but I'll get around to it some day. * Although there's a (no doubt totally unjustified) suspicion that his literary contributions roughly equate to Glen Larson's input into the numerous BATTLESTAR novels he supposedly bashed-out (while helming several successful, and quite a few unsuccessful, TV shows) from the late seventies onwards.